As much as I love my skincare and beauty, I always seem to neglect my haircare routine. I’ve found myself stuck in a routine of conditioning and trimming it until I can grow out all the bleach, but recently I’ve found myself collecting loads of haircare that has really helped my hair feel thicker and stronger, stay nourished, and make it smell incredible. If you saw my Monthly Favourites, you’ll know I’ve been loving the Herbal Essences Naked 0% range over the last month however I’ve been switching it up with the most incredible natural brand. NOAH was a discovery of mine at the NOPE 2015 show, and it’s complete natural – no parabens, sulphates, chemicals, it’s 100% natural ingredients and it has the incredible scent to reflect mother nature – plus it’s made in Italy which is my favourite place in the world, so this is a big win-win situation in my eyes. NOAH’s developers state that their range ‘isn’t perfect’ due to the natural ingredients constantly evolving and being unstable by chemicals that you’d usually find in your products, however they are pretty perfect to me – the Shampoo* has a gorgeous blend of citrus fruits to really cleanse and freshen up the hair, and one of the first shampoo products I’ve tried for fine and oily hair that has really given it noticeable volume and thickness. The Reconstructing Hair Wrap conditioner* also does the brilliant job in providing nourishment and softness with a delicious blend of yogurt and orange, making my ends feel full and absorbed with softening ingredients that’s perfect for weekly washing. For that ultra hit of nourishment though and those days when I feel like having a deep conditioning treatment, I love to use the Regenerative Hair Mask with Argan Oil* which just sinks in quickly and works to soften the hair beyond belief. The smell is very fresh and floral, and the consistency almost like a mousse which gives it that lightly whipped touch, you’ll want to smother it all over your hair daily. Since using all these products together, my hair has felt stronger, thicker, more volumised and also relaxed – it feels like the natural products have allowed my hair to stop fighting or working with more chemical based products and absorb the goodness, making it look longer (result) and feel full of life again. 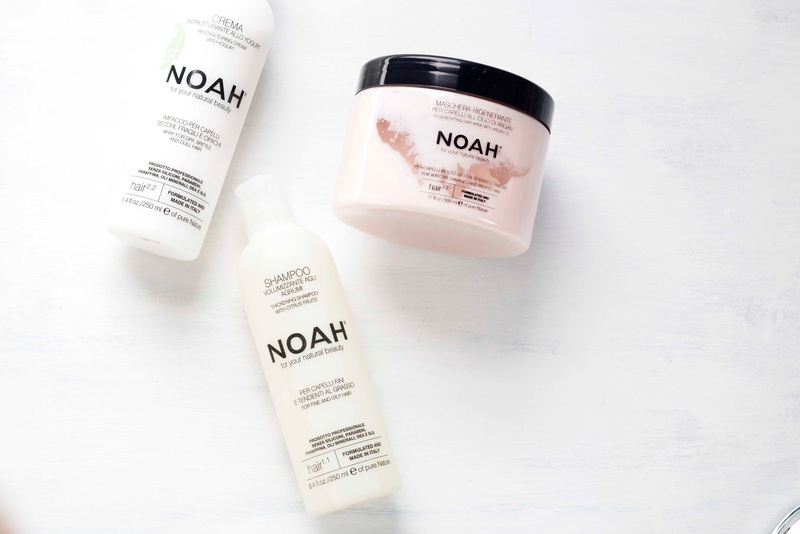 If there’s one new launch you need to try this month, it’s NOAH. Like I said, I don’t usually do much to my hair, but I’m always looking for more volume, texture and nourishment at the end of my hair to give my fine locks that bit of life. 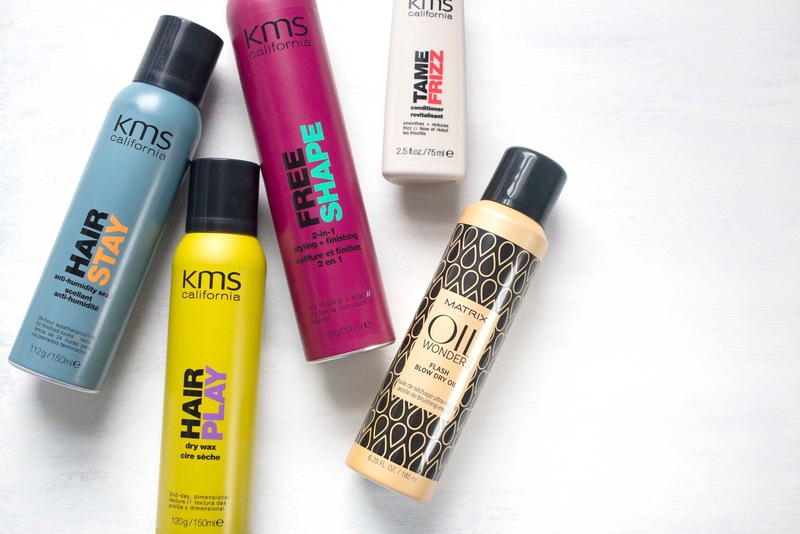 I’ve found in the past that products weigh my hair down – the opposite of what I want – and my hair feels ‘full’ so I’ve just let it do its own thing, but recently I branched out with some awesome KMS California and Matrix products thanks to HQHair that have completely changed my mind. Now as much as I love an oil in my hair, there hasn’t been one quite lightweight enough yet however the Matrix Oil Wonders Flash Blow Dry Oil* is something completely different; it disperses like a lightweight liquid and can be pumped straight into the hair or hands to rub in, and it just absorbs beautifully. Less really is more here but the dry oil keeps my hair feeling bouncy and healthy without looking greasy – thank you hair gods! Also keeping my ends in check is the KMS California Hairstay Anti-Humidity Seal* which not only helps hold you hair style but also prevents weather and humidity from changing the sleek edge to your look. For me, this helps my frizz completely calm down after washing, and keeps my waves looking defined all day long – one to pack for your holidays, or if you look like Monica from Friends. The Tame Frizz Conditioner* is something I’m yet to try fully as I have my NOAH and Herbal Essences conditioner to get through first, however from what I’ve experienced it does help improve the structure of frizzy ends, and really smooths out any waves or shape you have after washing with it (one for those who wake up looking like Mufasa), but now that my hair is all sleek and stylish now there’s a definite need for texture and hold, and these last too products have really impressed. When I saw the words ‘dry wax’ I freaked out a bit, but the Hairplay Dry Wax* really adds in hold and texture without feeling crunchy or weighed down. The spray distributes evenly and my hair really does oomph nicely, giving me that much desired height that I used to achieve with about ten cans of hairspray and back-combing minus the fumes and crunch. The only time I usually do try something with my hair is when I curl it, and the Freestyling 2-in-1 Styling and Finishing Spray* helps protect my hair from heat and give an amazing hold until washed out. There is a slight smell to it that does put me off somewhat and you can tell it’s in your hair, however when I ventured outside with freshly done curls and a spritz of this through the ends on a very windy day, my hair stayed put and looked just as fabulous when I got home – a small pay off for gorgeous looking curls all day long I think. As I’m totally loving my haircare at the moment, I thought it only fair to spread the love to you all with my first giveaway! To say thank you for reading my blog and also introduce you to my new favourite brand, I’ve teamed up with NOAH Haircare and Eterno Naturals to giveaway three absolutely incredible products including one of their zingy Shampoos, a Nourishing Conditioner and also a Regenerative Hair Mask – all worth over £40! To enter, you need to just head to the Rafflecopter form below and get following the brand (and me, if you fancy) to win this amazing haircare changing prize! The giveaway lasts 3 weeks so make sure you get those entries in – also please note to not post this link on money saving websites, forums or freebie sites as all entries will be checked. Happy Haircare! Have you tried NOAH or KMS California before? What is your ideal haircare routine? Have you entered the giveaway?